One of the highlights of my trip to County Down was visiting the huge megalithic tomb at Greengraves. 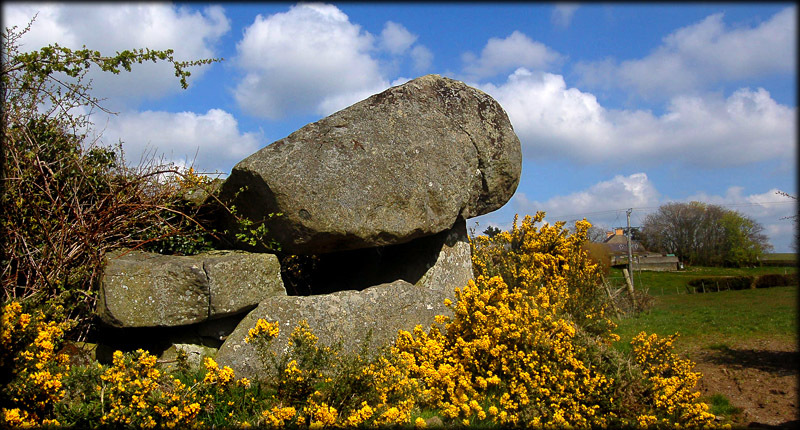 The tomb was surrounded with gorse in full bloom, which made for a very attractive image, but prevented us from getting too close to the dolmen. The tomb is known as The Kempe Stone which derives from Norse "Kampesten" meaning big stone or prehistoric tomb. The tomb has a large chunky capstone supported by two portal stones and a smaller capstone, which in turn is sitting on the back stone. 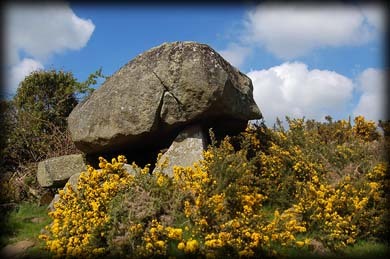 The largest capstone is at an angle common to most Irish portal tombs. Standing between the portal stones is a doorstone. According to Weir, the Green in Greengraves comes from the Irish Grian meaning "sun" . Situated: Very easy. From Belfast take the A20 towards Newtownards. Drive straight through Dundonald where shortly after the name of the road changes to Kempe Stones Road, take the first right down Greengraves Road. The tomb stands in a field to your left about 750 metres down this road. Discovery Map 15,21: J 4447 7363. Last visit Apr 2008.